No BS! Brass Band was purchased digitally. The home stretch. 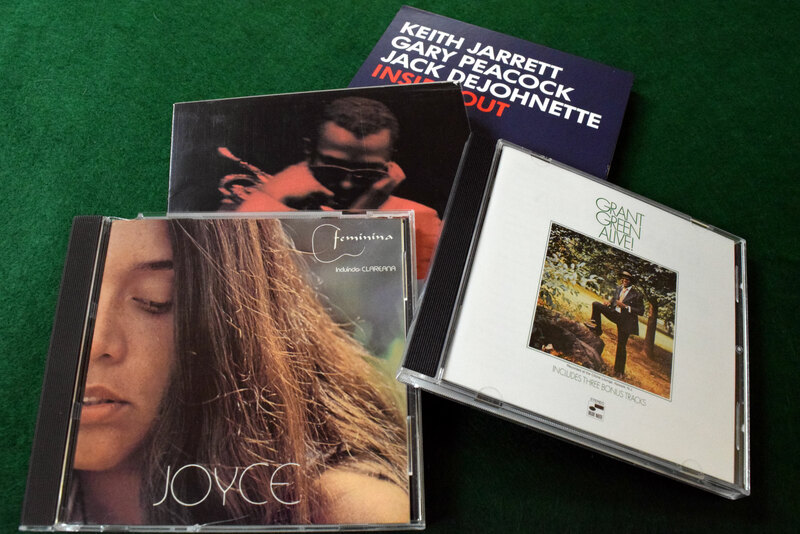 The middle four weeks gave us a Jazz/Funk quartets that likes to mix up covers, a child prodigy, musical LSD from one of the greats, and a powerful, solo piano performance. We are going to close with some legends, an artist who demands utter silence from his audience, and jazz from a distant land. In other words, still on track. Previous to this project, I had already picked a couple of Miles Davis staples, Birth of the Cool and Kind of Blue, as well as a couple other records. If you keep up with the blog, you know I am a big fan of Someday My Prince Will Come. Even though it was somewhat previously treaded ground, I was excited to see a Davis selection as part of this project, especially an album that I wasn’t familiar with. Davis performed ‘Round Midnight, a Thelonious Monk composition, at the Newport Jazz Festival in 1955. This rousing performance, with Monk at the piano (and who, on the way home, chastised Davis for playing it “incorrectly”), is considered by many to signal his comeback after an absence from performing and recording due to drug abuse. Shortly after, he signed with Columbia Records. He put together the first of several powerhouse quintets of his career, which included an up and coming John Coltrane, and released ‘Round About Midnight in 1957. If you buy the 2005 Sony reissue, the second disc includes this 1955 performance from the Newport Jazz Festival. “‘Round Midnight” – When my friend recommended this record, he described the opening of the album (which is ‘Round Midnight, the title track), as the saddest 10 seconds in jazz. I was in full agreement at the 11 second mark (though I would say that Old Folks, off of Someday My Prince Will Come gives it a real run for the money). The long, drawn out wail of Miles’ muted trumped pulls you in and doesn’t let go until the song fades out. I can only describe the sound as pure melancholy. “Bye Bye Blackbird” – This easy-going cover of the standard from 1926 is a great afternoon listen. While you have the required solos from Miles Davis and John Coltrane, I think the Red Garland’s piano solo (starting at about the six-minute mark) really makes this song. He dances and flutters around the keys, providing a sense of motion, which is then followed by Davis’s final solo. The muted trumpet transitions from the bright piano work, to Davis’s signature melancholic, drawn out notes; as if the song is saying goodbye to the protagonist. When this was recommended, my first thought was that I would be traveling back to New Orleans Jazz, but upon my first listen, it became very clear that about the only thing this band had in common with traditional New Orleans Jazz, was the lineup of brass instruments. In an interview with NPR, trombonist Reggie Pace stated that New Orleans Jazz already has a history and tradition that he didn’t think could be added to, so they set out to create their own blend of brass band music. This results in a decidedly funky, upbeat, and socially conscious barrage of sound that emanates from your speakers and materializes in the form of fun. For you adventurous folk, check out the six song suite on the back half of the album, where the band interpreted Kung-Fu movie night into a suite of six songs. Adventurous and cool, this band seems to be full of both qualities. “‘Tom Sawyer” – You might initially scoff at my recommendation of a rock cover for a jazz project, but jazz has always been about integrating sounds and concepts into the musician’s own interpretation. This version does that exactly. They capture the feel of the song, but with a decidedly jazz sound. Don’t believe me, check out the dirty, New Orleans trumpet about two minutes into the track. “Cinnamon Girl” – While a more traditional composition at its base, this song funks and grooves from start to finish. The tuba (yes, I said tuba) is laying down a super fat, base ingredient for the rhythm section. You can get lost just listening to that instrument alone, but don’t lose focus or you will miss out on the rest of the performance. This is the kind of song you put on during one of your parties, then sit back and watch the crowd go from a bit confused to shaking their tuckus’ in just under five-and-a-half minutes. This may be an old-hat fact for jazz aficionado’s, but apparently Grant Green was the most recorded artist in the Blue Note label’s history. I didn’t expect to find that nugget when he was recommended and I did my usual research. He also, if Alive! Is any indication, has a penchant for funking the hell out of jazz. This is a good thing as I have found through this project and outside listening, that the hard bop/soul jazz starting in the mid to late 50’s is one of my favorites. He carried that torch into this 1970 live release. “Hey Western Union Man” – Just slightly more mellow and with a particularly contagious groove, but no less funky, this soul cover showcases some of Grant Green’s great guitar work. His blues infused solo, starting at just under two minutes into the song, is a slow burner, but will set your shag on fire if you let it. Anything left will be turned to ash following Claude Bartee’s saxophone solo, which kicks in immediately following green’s guitar. Another one of those jazz artists that I had not heard of before, which is a good thing. Keith Jarrett got his big start playing with Art Blakey, he then went on to multiple other projects, both as a leader as well as a band member in others’ projects. Jarrett records both jazz and classical music, and is a proponent of purely improvised music, which is what Inside Out is composed of. Wholly improvised, live compositions. He apparently also has an enthusiastic disdain for crowd noise while he is playing and has been known to give cough lozenges out to the audience or chastise loud audience members. Due to that, he made my, “don’t go see” list. “Inside Out” – If you are ever hanging out in someone’s car and they ask you to listen to one more song before you get out, if they have Inside Out playing, run while you can. Out of the five tracks, the two shortest are over seven minutes. The next shortest is 18. The thing is, if you ride it out, there are lots of really great jazz nuggets in these improvised pieces. This title track is no exception. It appears he also has a great disdain for his music to be shared on YouTube. You’re on your own with this one. In the, I didn’t see this one coming department, Joyce closes out the jazz project. She is a Brazilian guitarist, singer, and arranger who has released albums since 1968. Good, bad, or indifferent, I have never had much of an appetite for world music, so this was going to be a difficult close. The music is rich and beautiful, which is a good complement for her voice. Though I don’t understand what she is saying, she certainly conveys emotion in her delivery. “Coração de Criança” – The breezy samba will grab you by the hand and take you to another, more relaxing place. It’s one of those songs that you don’t need to understand the language of the lyrics to fall under its spell. Her interpretation and emotional delivery convey more than enough for you to enjoy. Wow, what a journey! 13 weeks and 13 records. Several more if you count the rabbit holes I went down through this project (I’m looking at you Nick Drake). I recently read an article that stated, according to sales, jazz is the behind children’s music as the least listened to. As I read more and more about the history, some of it was brought on through the staunch philosophy and culture around not being commercial. It’s the double-edged sword art over accessibility. Jazz requires some commitment from its listeners, but it is by no means as snooty and pretentious as most people are led to believe. There are a lot of accessible and musically miraculous records out there, and the history is rich and deep; it strikes at the core of what is America, an amalgam of influences and reactions that comes together to form something new and beautiful. Regardless of cause and blame, it’s a shame this music falls somewhere behind Kids Bop 362.